Tso, can you Tsurf a Tsunami? Hokusai's 1831 "Great Wave off Kanagawa" and a picture of the Hilo Pier in 1946. The man (who did not survive) was named Antone Aguiar. According to the story at the Tsunami Museum in Hilo, he cut the ship Brigham Victory free from the dock, allowing it to ride out the disaster. The picture is from the archives at NOAA. There are two main kinds of waves, those that are produced by winds blowing over the ocean surface, the subject of the last two posts on the huge waves that struck Southern California last week, and those that are produced by massive disturbances of the ocean floor, either by earthquake, volcanic eruption, or landslides. 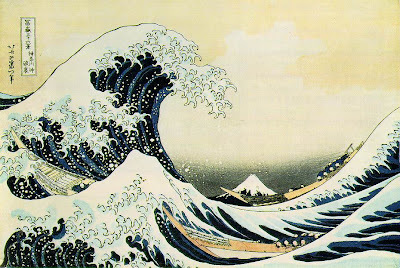 These are tsunamis, often (incorrectly) called tidal waves (there are tidal waves of a sort, called tidal bores, but they cannot be mistaken for a tsunami). After my adventures this summer, which included a grand tour of the Hawaiian Islands with two dozen of my students, and a mini-vacation in Southern California that coincided with the arrival of unusually large waves along the coast, I am writing a short blog series on the dynamics and geology of waves. Tsunamis have been on my mind, having seen perhaps hundreds of tsunami warning signs all over the coastal areas of Hawaii, and seeing, for the first time, tsunami warning signs in Southern California. I don't know when they started appearing (I suspect in 2004), but they certainly weren't there in the years when I was growing up in the southland. I used to have a more difficult time teaching about tsunamis, but that changed in 2004 when the Indonesian Earthquake produced the tsunami in the Indian Ocean that killed around 230,000 people. Because it hit tourist beaches, thousands of videos and photographs documented the event, and international media coverage was intense. Prior to that event there were not a great many photographs that documented what a tsunami could do, and the really tragic events, like those in 1946 and 1960 in Hawaii, had receded into ancient history for most people. Wind-driven waves and tsunamis are very different. Waves travel as swells across the seas, with turbulent water extending only a short distance beneath the surface (about half the wavelength). They travel slowly, a few tens of miles per hour, so they can take a week to cross an ocean, as the Tahitian waves did on their way to California this last week. The energy of the wave is expended only in shallow water at the coast, as the waves build up and fall over as rolling breakers. The amount of energy in a storm or typhoon is immense, but the energy is transferred to the water over time, and is dissipated over a period of days and weeks. A tsunami is generated in a moment, as an earthquake shifts the ocean floor, or a volcanic caldera collapses. Large landslides off of islands sometimes generate tsunamis as well. The disturbance affects the entire column of ocean water, from surface to seafloor, and all of the energy begins traveling very fast outwards from the point of the disturbance. Very fast. As in the speed of an airliner, around 500 miles per hour. In open water, they may pass without notice, as the wavecrests may be a hundred miles apart, and only rise and fall a few feet. Ships at sea are rarely affected by tsunamis. At shorelines, the story is vastly different. The oncoming waves hit the shallows at a high rate of speed, and friction slows the forward motion, but the energy is still there and it must be expended. The water surface rises and surges forward, quickly inundated the low coastal areas to depths ranging from a few feet to more than a hundred in some of the most disastrous events. The first indication that something is amiss often is a sudden emptying of shallow bays and a drop in sea level lasting several minutes. The surge follows shortly after. Other times, the sea just suddenly surges forward without warning. So, does California have to worry about tsunamis? The good news (sort of): we have big earthquakes on the San Andreas and other faults offshore, but they usually involve lateral motion that does not disturb the sea floor in such a way as to cause tsunamis. The bad news is that the northernmost coast of the state is close to the Cascadia Subduction Zone that is very much capable of producing huge tsunamis, and did in the year 1700. And of course as noted above, tsunamis can cross entire oceans, so large quakes in Mexico, South America, Alaska, Kamchatka, Japan, and all the other major seismic zones in the Pacific Rim can cause tsunamis that could reach the California coast. In 1964, the magnitude 9 Alaska quake produced a tsunami that killed a dozen people in Crescent City on the far north coast. Southern California is perhaps a bit more protected because of the presence of the Channel Islands, which would tend to break up some of the wave energy. But major tsunamis coming out of the south and west have some potential of reaching parts of the coast. And thus, the tsunami warning signs that have appeared. 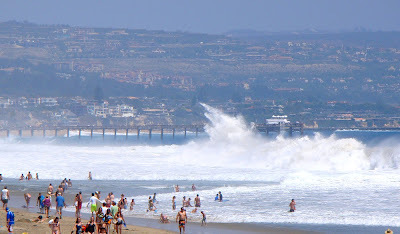 One last comment: when I lived in Santa Barbara many years ago, there was a tsunami warning based on the major quake that had devastated parts of Mexico City in 1985. Of course, people evacuated and headed for high ground, right? Of course not. They went down to the beach to watch. Thank goodness the tsunami was a dud in that case. A follow-up to my previous post about the huge waves that struck the Southern California coast last week. 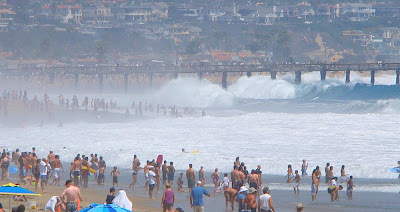 I was privileged to see some of the intense wave action at Balboa and Newport, and it was a sight. Some of the waves looked like they were reaching the height of the pier, and surfers were delighted. Unfortunately, conditions were very bad for casual swimmers with radio reports of at least 200 rescues, and one person was killed when he got caught between the waves and the boulders of a jetty. Where did these unusually large waves come from? Waves result from the application of energy to the water in some way. On rare occasions the energy is supplied by an earthquake or volcanic eruption, and disasterous tsunamis (incorrectly called tidal waves) are the result (update: you can read more about tsunamis in this new post). Most of the time waves are generated by wind blowing across the surface of the water. We are all familiar with ripples resulting from a light breeze, and it may be hard to imagine wind producing 20 foot monster surf, but when the wind is blowing hard, and over a distance of many miles, that is exactly what happens. We know from movies and "Deadliest Catch" (and for some, from personal experience) that waves in the middle of storms are violent, large and unpredictable. The waves are capable of swamping and sinking boats and ships. But what about when the storm is past? Shouldn't the sea calm down, and the waves disappear? Sort of. They disappear because the storm is dissipating, but waves are a form of energy transfer, and the energy is not stored. It has to move. The longer the wind blows and pummels the surface of the sea, the more the energy builds up and it starts to emanate outwards, sort of like ripples in a pond (well, exactly like that). The thing is, waves are not exactly physical objects. The swells are moving, but the water is staying in place, rising and falling in a circular pattern. Winter storms generally produce the biggest waves along the California coastline. When I lived in Santa Barbara, the summer swimming was usually no more turbulent than a swimming pool full of kids. But when the big storms started to blow out of the Bay of Alaska, the surf got intense. I lived a third of a mile from the seacliffs, and some nights I could feel the force of the waves impacted the rocks. So, why doesn't anyone surf in the open sea? That would be because the waves in the open sea are in the form of swells, which don't break or roll, they just simply pass by. The turbulence of the water extends to the depth of about half the wavelength (the distance between the crests of the swells). They are the cause of sea-sickness, though. It isn't until the waves hit the shallow coastlines that things change, and that is the whole dynamic of what happened in California this week. When swells encounter shallow water the energy is compressed into a smaller space. Friction slows the forward movement of the base of the swell, but the top of the swell continues forward unimpeded and begins to stack up, very steeply on the side of the wave facing the beach. The water finally spills over, forming the breaker, and sending a pulse of water upwards onto the beach itself. What's different now is that the water is physically moving forward with great force, and the energy is expended against the cliffs, the sand, or the bodies of the surfers who have wiped out. The precise amount of energy is determined by many things, including the shape of the coastline, the orientation of the coastline, the arrangement of offshore islands, and the distribution of shoals beneath the surface. So it was that a typhoon in the south Pacific Ocean around Tahiti generated swells two weeks ago that traveled thousands of miles across the ocean basin in a predictable pattern and speed. Their arrival in southern California was foretold and warnings went out to safety authorities. The red flags went up on the beaches, the surfers appeared out of nowhere, and the giant waves started to pound certain south-facing beaches. For a few people it was a nightmare and a tragedy, but for most it was a great spectacle (and one geo-blogger put up a couple of pics of the waves and saw his readership quadruple this week...thanks for the visits!). I'm in Southern California on a mini-vacation with the family, and the big news this week is the giant waves pounding the coast. A big typhoon in the southern Pacific (I think I heard Tahiti mentioned) is producing the energy that is generating 10 foot + waves. We were on the Newport Pier watching some monsters pound the beach at the Balboa Pier, seen in the background in these pictures. I'm astounded that so many people were in the water in these conditions. Red flags were up everywhere, and the lifeguards were probably having a nasty day. The waves were not as violent beneath us on the Newport Pier. I think the wave energy is being funneled by the shape of the shoals just offshore, and their height is being accentuated by the backwash of water flowing off the beach, but still it was an impressive display of wave energy during a time of year when waves are usually quite gentle. 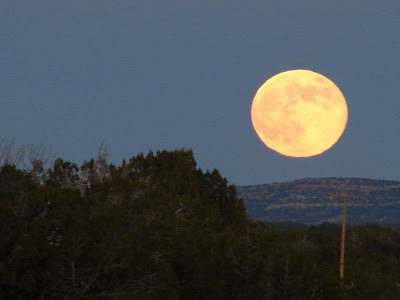 The moon rises over Black Mesa in northern Arizona during one of my trips there in 2007. Today marks the 40th anniversary of one of those seminal events in American history, the landing of humans on the surface of the moon (and getting them back!). It truly was a form of national lunacy, that in the 1960's we would put three men in a small metal cylinder on top of a massive rocket and send them into space. How many of you feel comfortable riding in even a 1960's vintage car or airplane, much less a giant rocket? The lunar module was designed with barely more than slide rules and human ingenuity! Acknowledging that many of you were not born when these events conspired, it was a different world. We were in open competition with the USSR, and we had choices to fight the war openly, or doing it by proxy, such as, maybe, racing to the moon. It's a pretty poor reason for going to the moon, but scientists of the time were pretty comfortable with the bargain. It felt a lot better designing rockets for space travel rather than for delivering nuclear warheads. And the rewards were legion, not just in scientific knowledge about the origin of the moon, but also all the advances in technology that had to be invented from scratch to make the whole thing work. I was born the year the first satellite was shot into space. As a child, I was fascinated with telescopes, with models of spacecraft, doodling rockets in the margins of my school work, and watching the adventures of the astronauts as each new milestone was reached. Somehow, when the moon landing was about to happen, my scout troop had scheduled our summer camp week! I wasn't going to see the great event on television. We wouldn't miss it though. Luckily, the camp staff managed to find a radio station with a signal that reached Circle B Scout Ranch in the southern Sierra Nevada, and they patched the event through the camp PA system. I remember wandering through the pinyon pines, looking at the moon, and listening to coverage as Neil Armstrong and Buzz Aldrin explored the first world other than our own. A lot of the people who cut their teeth on the moon shots stayed with the program, and the next decade included some incredible unmanned journeys that have continued the human journey. The Voyager missions stand out, with their incredible photos of Jupiter, Saturn, Uranus and Neptune, and their myriad moons. But there was far less interest on the part of the general public (and it is hard to give a ticker-tape parade to a satellite that was on the far side of Saturn). And so today we have a real job to do, especially those of us in the teaching business. It isn't as easy to get kids excited about astronomy, and geology, and biology, and the other natural sciences, not when there are so many bells and whistles in the media, on their games, on their phones. But where would those cool gizmos have come from if not for space program, and the technological advances that came with it? And what is a life without that spark of curiousity that drives us to go further than we ever have before? We are continuing a march towards the end our narrative on the geological history of the Colorado Plateau, one of the most unique regions on the planet. We've traversed nearly two billion years of strange events culminating in the beautiful scenery that we see today. In the last post, we were exploring a canyon that was missing a river. Today, we are looking at a river that is there, but shouldn't be. 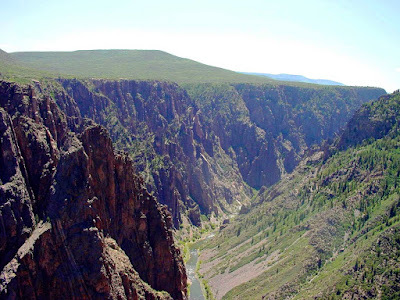 Black Canyon of the Gunnison National Park sits in the western part of Colorado near the towns of Delta and Montrose. 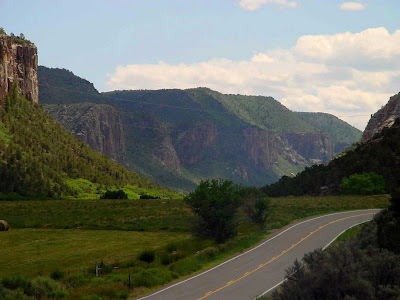 The park preserves a spectacular stretch of the Gunnison River where it has carved a canyon 2,000 feet deep, but which in places is only 1,300 feet across. The walls of the gorge are mostly vertical, having been cut through the very hard metamorphic and plutonic rocks of the early and middle Proterozoic. Other major rivers flow through the region, including the Colorado and Dolores. The thing is, no place on the plateau is quite like Black Canyon. It makes no sense at all. The problem becomes apparent when one approaches the park from the south. The road travels up a long grade out of a wide open valley that looks like it ought to have a large river in it, but it doesn't. Gullies on the south rim of the canyon flow away from Black Canyon, not into it. The river flows across a major uplift, and traverses the side of a ridge instead of a seemingly natural route to the south. How can this be? The previous post on Unaweep Canyon showed that rivers can abandon one canyon for another by way of stream piracy. Other events can divert streams as well, landslides being one example, and lava flows for another. Black Canyon falls in the latter category. The original river flowed across a landscape composed of softer sedimentary rocks, thousands of feet above the present surface. As the landscape was eroded in the years since the end of the Laramide Orogeny, volcanoes became active in the region, forming the West Elk Mountains, and diverting the river southward. By the time the river encountered the hard metamorphic rock, the channel was permanently entrenched, and the river could only cut downwards. And cut it did, carving much of the present-day gorge within the last 1 or 2 million years. Glacial runoff vastly increased the cutting power of the river, perhaps five times the present day flow (which is controlled by upstream reservoirs). Black Canyon is a fascinating place, in a region of full of interesting sights, including Colorado National Monument, the San Juan Mountains, and the Grand Mesa. The region is well-known for numerous dinosaur discoveries as well. Check it out! In our last exploration of the Cenozoic story of the Colorado Plateau, we were looking at a sort of mystery canyon, where a deep gorge had been cut into very tough Proterozoic rocks, but where no river exists today. The name of this beautiful canyon is Unaweep, which in the Ute language means "Canyon with two mouths". That's another view of the canyon in the top picture. 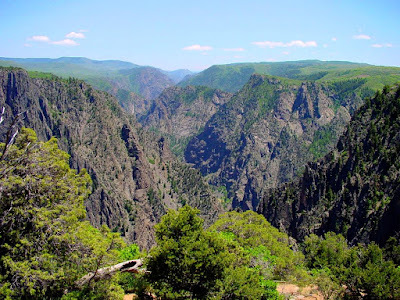 To help explain what went on here, I have included a picture of another incredible place in the same region, Black Canyon of the Gunnison National Park. I wrote about the rocks of Black Canyon last year in this post, but had little to say about the location of the canyon itself. Like Unaweep, it doesn't make a whole lot of sense at first. Notice how similar the two canyons are in certain respects. The main gorge is cut through the hard crystalline metamorphic rocks which date back to around 1.7 billion years ago, and there are softer sedimentary rocks along the canyon rims which have eroded back into a more muted topography. And then observe the big difference: Black Canyon is 'V' shaped, and Unaweep has a flat floor giving it more of a 'U' shape. A 'U' shape should cause even a basic geology student to think "glaciers", and glacial action would make a certain amount of sense. The ice ages ended only a few thousand years ago, and glaciers could have accounted for the shape of the valley and the fact that no obvious erosional agent exists in the canyon today. The region is elevated enough, and glacial action has indeed been suggested by researchers in recent times. I am unconvinced, though, because of the general lack of glacial features beyond and above the rim of the canyon. But it is a reasonable hypothesis. On the other hand, the similarity of the canyons cannot be dismissed. If you removed the Gunnison River, and let debris fall off the cliffs into the valley, it would start to fill in. And what if the river were dammed in some fashion? Again, debris would fill the resulting lake, forming a flat valley floor. But how can a river disappear? When canyons erode, they don't just get deeper. They get wider as a result of mass wasting of the canyon walls, but they also get longer as a result of headward erosion. The steepest part of a canyon system is often at the headwaters of the stream, and erosion tends to eat into the slopes of the mountains in an upstream direction. If a canyon is vigorously eroding into a mountain, it may actually intercept and divert drainages that were flowing in other directions. In other words, a river can steal the water from another river, an act of stream piracy. With the addition of more water from the stolen stream, the original river may erode even more rapidly, causing extensive changes to a landscape in a short period of time. You can probably see where this is going: what about the beheaded stream? Bereft of water, the canyon downstream of the diversion no longer has a river of any consequence and erosion ceases. Mass wasting of the canyon slopes will start to fill it in, and one is left with a mysterious gorge with no river inside. This is almost surely what happened at Unaweep Canyon. There is still a great deal of debate about the origin of the gorge; geologists are not actually sure which river once flowed here. Was it the Gunnison, the Uncompahgre, or was it actually an ancient path of the Colorado River? 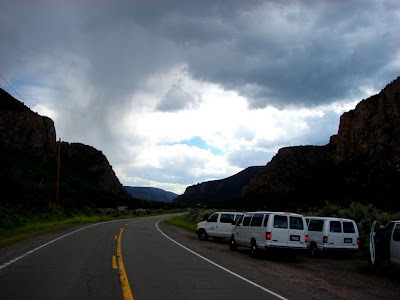 It is a neat little problem, and is well worth a visit if you are ever traveling in the country between Black Canyon and Grand Junction, Colorado. Follow Highway 141 south from the village of Whitewater to Gateway. The latest Accretionary Wedge deadline has come and gone, and as usual I am a day late. A big thank you to Volcanista, our host this month, who has suggested the topic of our inspiration to enter the geosciences. I have talked about my inspirations a couple of times in previous posts, but I don't think I have told the whole story yet in one place. Volcanista is certainly right about the idea that few people enter college thinking to major in geology or other earth sciences, and the reason is obvious: earth science does not receive the appropriate respect or emphasis as a science in the elementary and secondary school systems. In my ancient days earth science was simply not offered at all. Today in California, earth science is usually taught in ninth grade as kind of a bonehead science course. I am thankful to know a number of teachers who labor in the trenches, making the science come alive for their students. But by the time any of their students make it through their senior year, they have forgotten anything they loved about the science. And so it was that I found my inspiration elsewhere. I, like any kid, was fascinated with dinosaurs and fossils, but as far as we knew in the 1960's, no one made a career out of paleontology. The dinosaurs were extinct, and so were the people who found them. They were historical figures from the late 1800's or the 1920's. It was in those days before Jurassic Park and paleontology rock stars. When I was an eight-year-old there was a guy, Mr. Ritchie (I guess it makes me old, but we called big people Mr. or Mrs. in the day) down the street who had a really nice mineral collection. He would let the neighborhood kids look at his displays and I was fascinated by their symmetry and color. I spent hours digging in my backyard for crystals, and I especially loved a box of minerals left behind by a previous owner at our house. Even today I know there were sulfur and galena specimens in there because I recall the odor every time I work on the specimens in my lab. Later in life (two years later), I saw the Grand Canyon for the first time, and as recounted in my blogpost a few weeks ago, I found my first fossils. I was hooked, but didn't know it yet. I still didn't realize that there was a science called geology that went along with astronomy and chemistry and those other cool fields. High school was a fog and a near total loss as far as science was concerned (I did dissect a grasshopper and a pregnant perch, and probably am still adversely affected by the formaldehyde). I was in the scouts though, and learned to love topographic maps and orienteering. I also spent every available weekend hiking all over the mountains of Southern California and the eastern Sierra Nevada. I still didn't know I would be a geologist. It worked something like natural selection: I had the interest (crystals and fossils), and I had some of the basic skills (maps and compasses), I just hadn't found the field in which the skills and interests would be useful. Once I entered the correct situation, those pre-adaptations allowed me to survive! It happened when I entered the community college system in California. My first quarter at Chaffey College included a class in Earth Processes with Rod Parcel (who passed away a number of years ago). I realized that maybe I was onto something. The next quarter I took a class in Earth Materials with Marlin Dickey, and at the same time I took a course on the geology of the Grand Canyon that included a week-long field trip into the incredible gorge. Some of my adventures are chronicled here and here. From the day I walked out of the canyon, I was hooked for good. Given the tragic economic situation in California right now, our community college system is in a world of hurt, and I want to give a voice of support for how they support our state economy, and at the same time provide incredible opportunities for our citizens. They are not costly, and they provide an academic path to success that many people would otherwise miss if the system didn't exist. And so it was for me. It's kind of strange, what's happened to the Colorado Plateau. For more than a billion years, the region was one of the most stable areas on the planet, lying submerged under shallow seas, or lying exposed as desert dunes or river floodplains. Something like two or three miles of sediments accumulated, providing us today with one of the more complete records of the earth's history for the entire existence of complex life forms. Then, all of the sudden (in geological time), it got scrambled up. The Laramide Orogeny, starting a mere 70 million years ago, upended the sediments into a series of domes, basins and monoclines. The entire region was lifted around two or three miles, and the inevitable, relentless forces of erosion began to strip away the sedimentary cover. 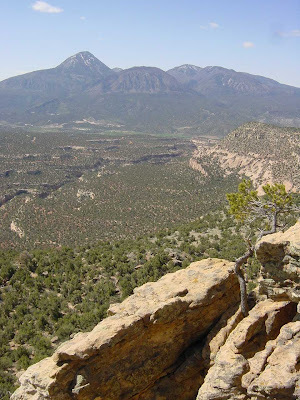 Though we have mentioned the early volcanism and the deposition of lake sediments at Bryce Canyon and Cedar Breaks in recent posts, the real story of the Cenozoic Era in the plateau region is one of subtraction of sedimentary rocks on a massive scale. The reasons for the disruption of the crust can be traced to my home state of California, along with Washington and Oregon. A subduction zone had been present here for tens of millions of years, but aside from developing a chain of volcanoes that dropped ash all over the region, the effect inland had been muted. During the Laramide Orogeny, it is thought that a huge segment of subducted oceanic crust did not sink into the underlying mantle as would be normal, but instead got caught scraping along the base of the continent, leading to the deformation and uplift that characterized the orogeny. As the oceanic crust finally did sink, it allowed the burst of volcanism to sweep across the region, as mentioned in the last few posts. It left behind a strange erosional landscape in the American West that includes mountains completely buried in their own debris, whole swaths of deep crust forming the summits of mountain ranges, older rocks pushed over younger rocks, rivers that run nowhere, other rivers that cross mountain ranges in illogical places, and canyons whose locations make no sense at all. And there is that ultimate expression of river erosion for the world, the Grand Canyon of the Colorado River. This is the kind of thing that brings home the concept that we are living in one of the best times to actually be able to comprehend the history of our world: the story of a billion years of geological history pushed upward and exposed for our study and understanding. This all brings us to a sort of puzzle for the day. The photo above is a beautiful canyon in western Colorado. It has been carved through a massive uplift, and the walls along the bottom of the canyon expose Early Proterozoic gneiss and granite; it is one of the most accessible places for observing these rocks, in comparison say to Grand Canyon where one has to hike 4,000 feet downhill to see the rocks. We obviously drove to the site. The canyon is well over 2,000 feet deep, including more than 1,000 feet cut through the very resistant metamorphic rocks. The name of the canyon in the Ute language is "Canyon with Two Mouths". And that's the problem of the day. The canyon does have two mouths, but it's missing something in-between: a river. There are two pathetically small creeks flowing out of the canyon in two different directions, and in no universe could those little rivulets have carved this gorge. So, where did it come from? What carved it? Another couple of perspectives of the volcanism that effected the Colorado Plateau between 20 and 30 million years ago. 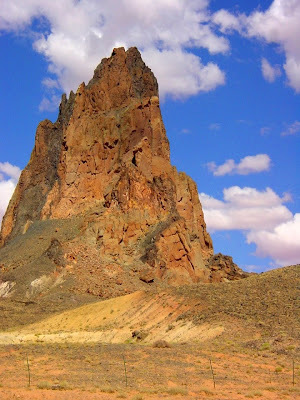 A very accessible view of a classic volcanic neck can be had from Highway 163 a few miles south of the Utah-Arizona border near the town of Kayenta, Arizona. 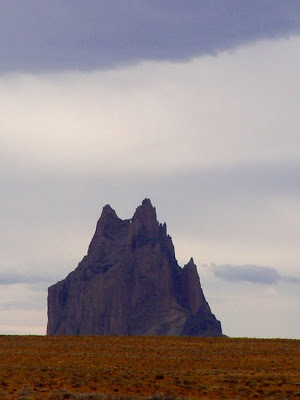 Agathla Peak (sometimes called El Capitan) is almost 1,500 feet high, and as can be seen in the photo on top is not composed solely of dark volcanic rock. Instead, much of the prominence is composed of large fragments of the surrounding sedimentary rock, shot through with dikes of darker volcanic rock that have more or less welded the pinnacle together. The surrounding rocks are shales and siltstones of the Chinle Formation. The second photo is of Navajo Mountain, described at the end of yesterday's post. I had intended to include a photo, but to my surprise found very few of them in my archives. It strikes me that as I travel through the plateau country that the mountain looms in the background of nearly every part of our route. It comes into view soon after we leave Grand Canyon National Park out to the east. 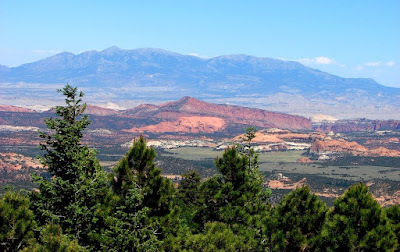 We drive south of the mountain as we approach Navajo National Monument and Cedar Mesa. It rises to the south when we drive through Escalante-Grand Staircase National Monument. And yet for all that, I hardly ever snapped a shot! But here is one from Cedar Mesa. The mountain is covered by sedimentary rock that has domed up over the volcanic rocks underneath. Continuing a long-running adventure, we pick up the tale of the geology of my cherished corner of the United States, the Colorado Plateau....we've come through 2 billion years of the story, and are now only 20 million years from the end! Volcanic activity had not been a prominent part of the geology of the Colorado Plateau for hundreds of millions of years, throughout Paleozoic and Mesozoic time, except for the volcanic ash that drifted in from elsewhere and ultimately provided much of the color of the Morrison and Chinle formations. That all changed in Cenozoic time. As outlined in yesterday's post, there was a vast outpouring of lava and tephra across much of the western United States around 30 to 20 million years ago, which resulted in the formation of numerous volcanic necks, calderas and the subject of today's post, laccoliths. There are some real oddities in the landscapes that make up the Colorado Plateau, islands of rock with alpine snowfields and deep green forests that seem more like the Rocky Mountains than part of a desert. These strange out-of-place mountains include the La Sal Mountains (top photo), the Abajo Mountains, Navajo Mountain, the Henry Mountains (center photo), the Sleeping Ute Mountains (bottom photo), and a number of others. The highest, the La Sals, top out at over 12,000 feet. 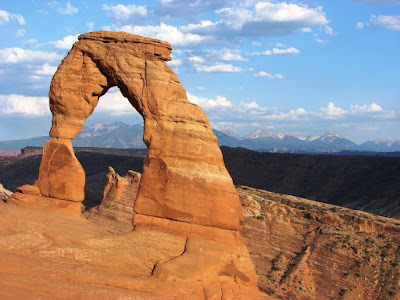 They are a beautiful addition to the landscape; imagine Delicate Arch in Arches National Park (top photo) without the dramatic backdrop of the La Sal Mountains in distance. How can such mountains develop out of an otherwise flat landscape? They aren't volcanoes, not in the sense that we normally think of them, but they are volcanic in origin. The mountains are made of a semi-coarse-grained igneous rock that has a number of names, but diorite will do for the moment. 'Coarse-grained' usually means the rock results from slow cooling of the magma miles underground, but the rocks forming the core of these mountains are sort of a hybrid, showing a fine enough texture that they were probably a few thousand feet below the surface, rather than several miles beneath the surface. G.K. Gilbert was studying exposures of these rocks in the Henry Mountains in the 1870's and he realized that although there were complexities, the rocks tended to squeeze between sedimentary layers, and to make room, they pushed the overlying layers upward into a domelike structure, much like a blister pushes the skin upwards. He called these igneous 'blisters' laccolites, and eventually they came to be known as laccoliths. 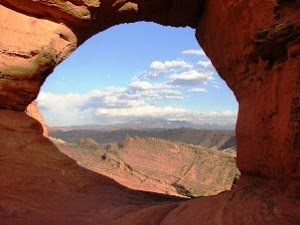 Navajo Mountain appears to be an ideal example of a simple dome-style laccolith. It certainly looks the part. The more complex mountain ranges include multiple laccoliths at different levels, sometimes branching out in several directions. They often probably constituted the plumbing systems of volcanoes that developed on a surface many thousands of feet above, but have since been eroded away. I've been seeing a fair number of geobloggers giving apologies for not blogging recently, and then I notice I haven't posted anything in nearly two weeks. It's obviously field season! I've actually been home for a couple of weeks, but other projects took precedence, not the least of which was a lot of weeding. I spent most of the last month discussing the active volcanoes of the Hawaiian Islands, and I will return to that project soon. For the moment I am taking the blogger's perogative to change the subject. 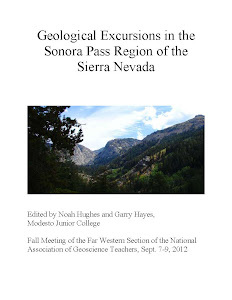 I have come close to completing a year-long project on the geology of the Colorado Plateau, and there is a matter of some serious volcanic activity in Cenozoic time across the plateau country. The Plateau is above all about horizontal rocks. They may form cliffs, but it a simple truth that the landscape is dominated by sedimentary layers of sand, silt, clay and lime. Throughout Paleozoic and Mesozoic time, thousands of feet of rock were laid down, but in Cenozoic time things were changing. The land was rising and buckling so that the last sediments formed on the plateau were in freshwater lake basins of somewhat limited extent that form the colorful rocks of Bryce Canyon and Cedar Breaks today. The Laramide Orogeny, which had lifted the Rocky Mountains, was also responsible for the vast changes in this region as well. The tectonic conditions responsible for the deformation was to have one other effect on the land: volcanism. Driving across this strange and scenic landscape, one is struck every so often by the sight of rocks just sticking up into the sky. The ancients were pretty sure that these were the remains of monsters who had been frozen in stone. Although geologists have a wonderful time debating the reasons, the fact is that from about 30 million years to around 20 million years ago, volcanism swept across the region, leaving behind all manner of volcanoes, calderas, volcanic necks, and strange laccolithic mountains (see the next post). 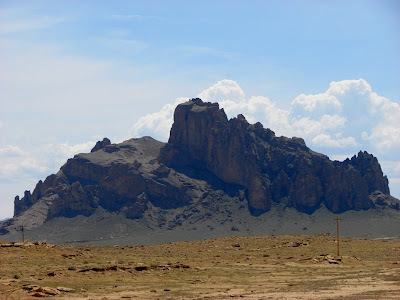 Today's pictures include a couple of volcanic necks, including Shiprock in New Mexico. These are the cores of volcanoes that have been exposed by intense erosion.